Benchmark your freight rates, find savings opportunities, and negotiate with more confidence. USRail Impact is an online application to help your company manage its rail spend. With a license, you get unlimited support from our team of experts. Take advantage of our 100+ years of rail pricing experience to discuss long term rate strategy, create management reports comparing your transportation costs to competitors, and prepare for rate negotiations. USRail Impact is the enhanced version of its PC-based predecessor, USRail.desktop. When you license our software you also get unlimited product support from our team with over 100 years of rail pricing experience (on each side of the table). Whether you want to discuss long term rate strategy ideas, get ready for a presentation to management on your transportation costs versus the competition, or preparing for an important meeting with a rail carrier, take advantage of our insight and experience. Are you negotiating the best rail freight rates? 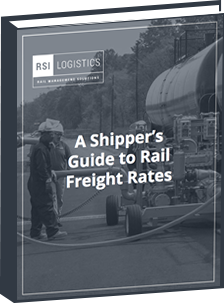 Download the free eBook, A Shipper’s Guide to Rail Freight Rates to learn how to navigate and negotiate rail rates like a pro. USRail Impact allows you to quickly view routing options and rail mileages. The program knows the serving carriers for each rail station and junction. Enter your origin and destination and USRail Impact will provide the options. We’ve been helping shippers improve their rail rates for more than 30 years. What purchasing manager would ever spend significant dollars without understanding a vendor’s costs? USRail Impact includes a proprietary cost model in addition to the government’s Uniform Rail Costing System (URCS). Our cost model is updated with quarterly railroad financial data and it is used by a number of railroads as well as the majority of large rail shippers in the U.S. Knowing the operating cost isn’t critical only for developing rate targets, it’s also a useful tool for estimating rail rates without needing to request and wait for a quote. Analyze Your Rates the Same Way Railroad Pricing Managers Do. Do you know how your rail rates compare to what other shippers are paying? USRail Impact has a large database of sample freight bills from the Surface Transportation Board as well as profitability comparisons generated from railroad data. You should understand how carrier market shares are changing and consider if there are railroad pricing strategies that are influencing those trends. Ready to get serious about controlling your rail rates? Register for one of our live or on-demand webinars. What is the fuel surcharge miles for this lane and what is the current rate? Where is the map for the SJVR, who is the rate contact and what is their phone number? What is the abbreviation the railroad for Guanajuato Mexico? This industry requires a lot reference information and having much of it organized and kept up-to-date in one place saves countless hours. See how USRail Impact has helped this company improve their rail rate processes. View a summary of activity including quick access to webinars and website blogs. Save details of lanes in a secure database for easy access and analysis. Identify customer stations with the associated serving railroad(s). Analyze the individual rail segments of your lanes by railroad. Access government data to determine rate and volume trends for your commodities and view detailed freight bill information. Obtain needed information quickly including access to railroads’ websites, stations, junctions, and more. Determine and evaluate alternative routing options between stations. Obtain railroads’ operating and fuel surcharge miles between stations via alternative routes. USRail Impact is an invaluable tool; we use it every day. It has helped us expand our market opportunities. We quickly developed great confidence in the accuracy of the rail rate estimates. It couldn’t be easier or faster to use. The best rail costing tool keeps getting better and the benefits far outweigh the modest cost of the software. We continually use it in our negotiations and to determine our competitiveness in markets in a rapidly changing environment. One neat package that has saved us time and money. It puts information from multiple sources at the user’s fingertips, so they can conduct individual lane analysis or high-level market and logistics projects. It’s a user friendly ‘no-brainer’ purchase for anyone shipping commodities by rail. We use USRail Impact all day, every day. So much information all in one place; it’s a real time saver. The application made it easy for us to analyze over 150 lanes quickly providing railroad miles, costs, and profitability. We now have a much better handle on where we stand for upcoming negotiations. Our company relies on USRail Impact to quickly and easily assess our rail rates; and in the process, identify those that do not meet our reasonableness standard. The tool has served us well as a valuable negotiating tool. © 2019 Rail Management Solutions. All Rights Reserved.